Chapter 2 of our Ocarina of Time 3D walkthrough just went live! This chapter takes you through the first dungeon of the game: the Deku Tree. Defeat the various bugs infesting the Deku Tree’s hollow to break his curse! 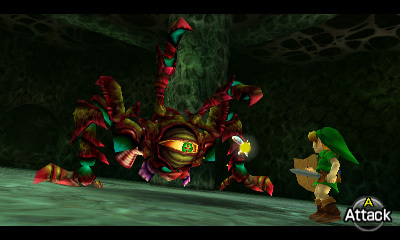 Of course, this is just the beginning of our Ocarina of Time 3D bonanza. Check back for daily walkthrough updates, and upon the game’s U.S. release on June 19, start looking for specific mentions of changes made to the 3DS version including atmospheric and graphical retouching, content revision, and new content! (Also, for those of you wondering about that musical track – we’ll be able to reveal it eventually. Just be patient.) We obviously can’t include screenshots of the 3DS version just yet, so in the meantime we’re using screens from the GameCube version courtesy of Youtube LPer AceofSuns. We’ll update with 3DS images and other content as soon as we can!